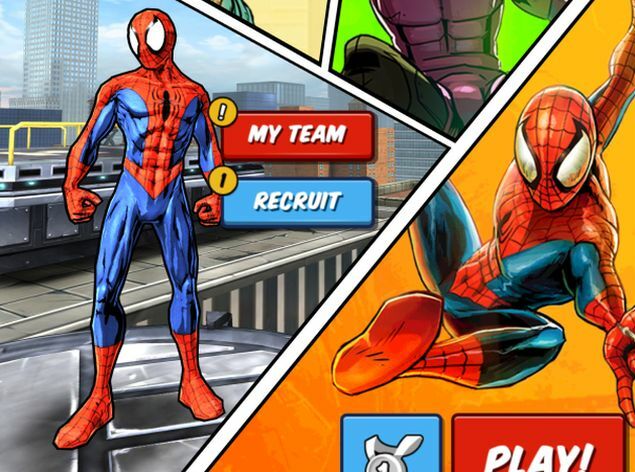 An all time favorite of millions and one of the more famous Marvel Comics super-hero is back on our iOS devices with a brand new game, developed by Gameloft. On very rare occasions I get the pleasure of playing and reviewing apps that I really love and want to play. Spider-Man Unlimited is one such game. The new Spider-Man game is an endless runner game where players will have to control the hero as he tries to avoid obstacles and bad guys and collect ISO-8 to unlock extra content. The new Spider-Man unlimited game will no doubt leave lovers of Spider-man comics books very happy as unlike games likes these which are mostly based off movies, the developer chose instead created their game off a comic book, even the landscape of this game resembles that of a comic book. Spider-Man Unlimited takes you into a world of pure comic book fun where Spider-Man tries to stop the Sinister Six who had open a tear in the fabric of space, and now alternate versions of Spider-Man’s foes are pouring out to cause major damage, unless Spider-Man can stop them. Luckily you have different alternate versions of Spider-Man himself straight coming straight from the pages of some of Spider-Man greatest stories all with their own special abilities. They are Spider-Man Noir, Iron Spider, Cosmic Spider-Man, Scarlet Spider, and the Bombastic Bag-Man. As you run around through Manhattan you’ll be able to run through story mode, unlimited mode, and event mode, depending on what you’re feeling like. The game is divided into two modes – a story mode and a free running mode. There are also timed events which take place where you can earn points and experience. The story mode missions have certain objectives, for example beat 10 henchmen, collect 10 medpacks, and so on. You keep running and playing the way you would Subway Surfers, and once you’ve reached your goals the level ends and you earn your vials, experience and ISO-8. In the endless mode, you’re playing for experience and vials. Gameplay is very simple and fun as it is the usual swipes of left, right, up, or down while collecting fuss on your way. To attack or to fight enemies is very simple; all you do is swipe Spider-Man up and down. Collect power-ups to help you. To swing you tap and hold Spider-Man. Unlike some endless runner games, this game doesn’t leave you guessing what to do as it has a tutorial on gameplay immediately as you start playing the game. Another thing I like about this game is that you play through different comic issues of Spider-Man, therefore allowing comic book lovers to relive those moments, only now they can join in the fun instead of reading. Unlike some other games, Spider-Man Unlimited gives you free revive which allows you to continue your game when you die for free. This type of stuff normally would cost you something and shows that the developers are not merely concern with making lots of money but also about you enjoying the game. Spider-Man Unlimited is a fast-paced game that mostly has you dodging back and forth between three lanes, dodging obstacles which are very fun as some times you never know where these obstacles will popup or which it will be, grabbing currency, and attacking enemies. But you’ll also web-sling with the greatest of ease, or wall-crawl your way to greater heights, or smack the spit out of a boss or two. Sometimes, you’ll be slinging webs in order to leap through the sky. Other times, you’ll be free-falling, dodging whatever’s coming at you. It’s not like some other endless runner games, e.g. Subway Surfer (see review here where you feel like you’re playing the same thing over and over. It’s an endless runner game with a difference. It’s an endless runner game with levels to complete which actually makes it very fun. As you play you are guided along in completing each level so you know exactly what your objectives or, there is obsoletely no time to idle while the enemy is running lose on your turf. With the leveling system put in place you have to reach specific targets before you are able to unlock new levels. This is where diving into the Endless mode proves useful in grinding out some experience, as well as completing side missions in Story mode. 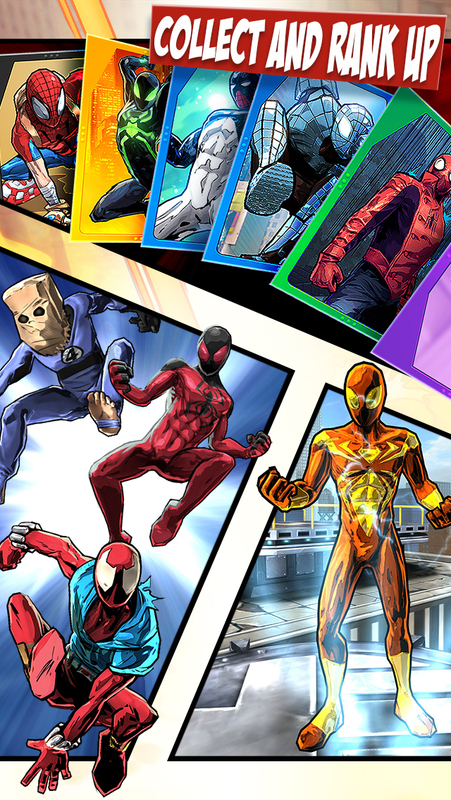 Furthermore, you can fuse together newly gained Spider-Man cards to help you along. As you play you earn various currencies which can be exchanged for Spider-Man cards. These cards can earn experience when used in play, and that experience that will eventually give them a higher score multiplayer. The cards can also be sacrificed for a quick shot of experience, or to rank up the card to increase their level cap. One thing is sure is that Spider-Man Unlimited is very fun, but there or some cons. One such is an energy system that slows down your progress if you die too many times and run out of lives. The good thing is that It doesn’t kick in until Level 10, giving you some hours of gameplay. This no doubt can be a big hurdle for many. Another issue is that of controls as they are not so responsive at times. However this will not take away from the pure fun of this game. Regardless of the two issues with Spider-Man Unlimited, I am sure fans of Spider-Man will not mine two much the few negatives.